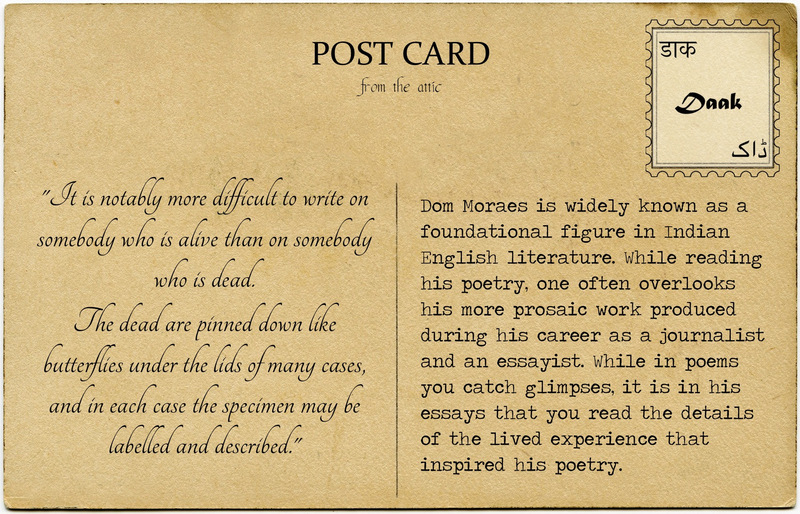 Dom Moraes is widely known as a foundational figure in Indian English literature. He was an editor, essayist, scriptwriter and journalist apart from being an extraordinary poet – for which he is best known. His poems are possibly his most prolific work and his gift lay in his ability to capture unexpressed thoughts in verse. In one such poem, he talks of absences. No vigils left to keep. No enemies left to slaughter. Only shelter microliths and fossils. On the architraves of hills. No wounds left to be healed. Nobody left to be beautiful. Disturbing the balance of death. So much silence was not heard. Clouds scuff like sheep on the cliff. The echoes of stones are restored. By its variety of absences. While reading his poetry, one often overlooks his more prosaic work produced during his career as a journalist and an essayist. His personal essays are especially remarkable. While in poems you catch glimpses, it is in his essays that you read the details of the lived experience that inspired his poetry. In a collection of essays titled ‘Where Some Things Are Remembered: Profiles And Conversations’, he captures the essence of people he knew with remarkable openness. For instance, while profiling his father, Frank Moraes, he lays bare his experience with his mother’s mental illness. To let out something so intensely personal and guttural with such eloquence is characteristic of Moraes. Full of profiles and conversations, the book begins with a passage written by Moraes in 1980. It is a passage on writing about people. This musing promises a valuable read for those of us who wish to document people – the ones we know and the ones we strive to know through sources other than our own accounts. You can read more in the forthcoming book “Where Some Things Are Remembered: Profiles And Conversations – Dom Moraes”, edited by Sarayu Srivatsava. Find a web link here and buy the book here.